As soon as war was declared a number of charities began appeals. Within days the Prince of Wales’ National Relief Fund was set up to help poorer families whose men had joined the colours, £1 Million was raised in the first week and £5 Million within a year. Throughout Wiltshire donations contributed to these totals. A wave of enthusiasm for the activities of the Red Cross swept across the county. In Swindon a public meeting raised £322 on the spot, another collection, a month later, brought in another £303. Local women and girls started work on the 2,500 garments they would produce for wounded soldiers. Other charities related to the war effort like the YMCA had similar success throughout the county. With the arrival of Belgian refugees money was raised to support them. This was followed by flag days to assist the civilians of our Allies suffering privation – France, Serbia, Belgium and Russia. Funds were set up to provide cigarettes and tobacco for our troops – the North Wilts Herald fund promised that all donations will be spent entirely in smokes, not one farthing deducted for Fund expenses – our services being freely given. As the war progressed the Government recognised that extra finance could be raised to fund the war effort by appealing to the public’s patriotism. In March 1916 the National Savings Committee coordinated a loose affiliation of financial institutions supplemented by local volunteer associations to create a mass savings movement. The principle institution was the Post Office Savings Bank where as little as 6d. (2½p) could be saved for a stamp to affix to a War Savings Card. About £300 Million (worth £15,400 Million today) was raised through War Bonds. Salisbury Tank. With permission of Terry Crawford. 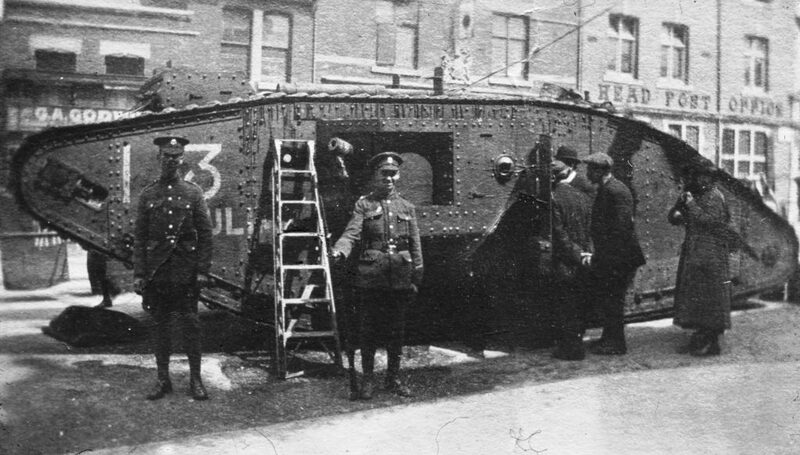 In 1918 tours of the new wonder weapon, the tank, were arranged. 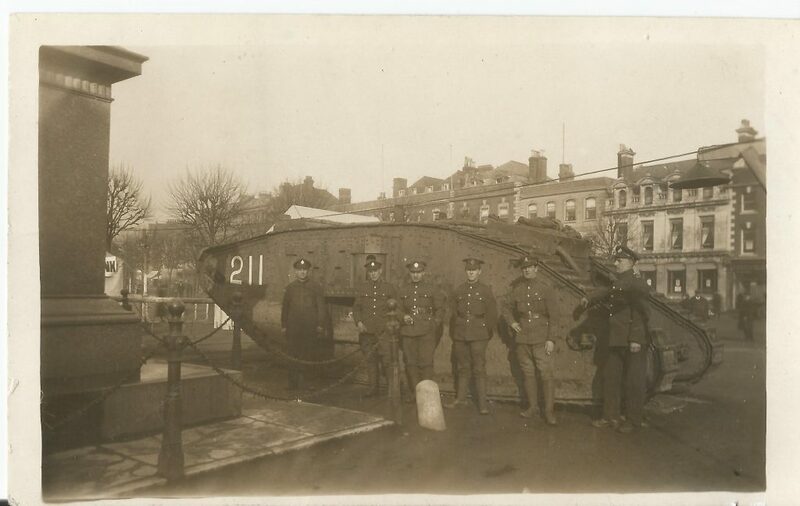 During Salisbury’s War Bond Week 4th-9th March a tank was displayed in the Market Place. £162,204 was raised, more than three times the target. In May H.M. Tank No 113 named ‘Julian’ was the centre of attention in the Market Square, Swindon Old Town where the Mayor kicked off the fund with a donation of £50. Huge crowds lined the streets to watch Julian’s progress to the Town Hall which included smashing its way through a barrier of sandbags and wire which had been put in its path. Children were allowed to peep into the mysterious interior if they bought a War Savings Certificate. “Julian” – Tank Bank, Regents Circus, Swindon.